Here I am talking again about more problems that the majority of people wish they had. Since Lufthansa cancelled the Frankfurt to Hyderabad service a couple of years ago, I have been searching for convenient ways to get from North America to Hyderabad. Despite being the sixth largest city in India, and a heavy-weight in technology, direct flights from Europe or Asia are few and far between. British Airways is a preferred option, mainly as someone who is a “points-monger”, but not someone who is willing to undertake an internal transfer in India. I am talking here about the new British Airways Club World Cabin, not the cabin that looks like it was lifted from an officer cabin from a Royal Navy Warship circa 1865 (you know which one I am talking about – just avoid those flights altogether for business class, as they still exist on some trans-Atlantic Boeing 767 flights). 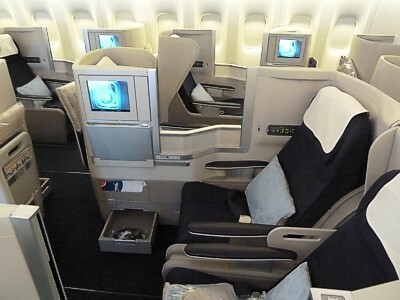 I have flown on the Boeing 747, 777 and 787 configurations of the new Club World cabin. British Airways has adopted this staggered format layout with seats alternating between rear-facing and forward-facing seats – a lot of people aren’t too keen on this configuration, but I don’t mind too much. If you want privacy, try to get a window seat on all configuration types, and as is typically echoed on SeatGuru and SeatExpert, avoid the rows at the very front and back of the Club World cabin. In the Boeing 747 and 777 airplanes, the configuration has two side-by-side rear-facing middle seats. These are least preferred unless you happen to have no-one sitting beside you – then you have a luxurious amount of space. There have been occasions where I lept into the middle pair of empty seats as soon as the airplane door closed and it was clear no-one was using them. Mine, mine, all mine. Try asking at check-in, too – that might be a little less drama. In the Boeing 787, there are three seats in the middle of the plane so avoid the middle unless you like feeling claustrophobic. The new 787 is a nicely styled black and grey variant of the new cabin. I like it. The Club World seats like totally flat and horizontal, which is mandatory. Despite the odd cabin configuration, a privacy screen with frosted glass provides the necessarily isolation from your neighbour. I am a pretty slender guy, but even I find the seat a bit narrow. Rolling over when sleeping requires a special technique. The seat has a decent sized drawer near the floor to hold your stuff. In the seated position, there is an infinite amount of leg-room. The LCD touch-screen and tray tables flip-open when needed. I like the fact that the tray-table slides forward and backward. For some reason, British Airways has a dual jack headphone plug that works, but not that well, with external headsets – I always find it too loud when I only plug into one of the jacks. The cabin service has always been friendly on British Airways, and I enjoy having a snack-service bar always available. The service director once gave me 10,000 Avios points because my electrical outlet malfunctioned during a flight, which was awesome because I slept most of the flight anyway. That’s the kind of customer responsiveness I appreciate. Another plus of British Airways is travelling through Heathrow Terminal 5. It is big, but modern and efficient. I do not like the Club World lounges because they are way too busy. If you happen to be flying from the Terminal 5 B gates, head to the lounge out there because it is not as busy. The ones in the main terminal building are crowded. My plan involves stopping to eat at Wagamama. Yum. When you are travelling 20 hours to get to your destination, a stop-over with their curried chicken on rice with gyoza and a beer hits the spot. I spend more time at Wagamama than in the lounge, and I only use the lounge in the B-gate satellite terminal.